A brief moment of silence for one of the best burgers that we ever tried. The West Branch closed in early 2010. Finally, a burger in NYC that lived up to a price tag in the teens—this one was worth every penny of the nineteen bucks. This was a perfect burger. I had gone back four times, and I do not live in NYC. One more time, and I would have been forced to join the cast of the Biggest Loser where I would have paid Jillian Michaels to bite a hole in my cheek. At center stage was a formidable, thick patty of coarsely ground chuck with something special. They ground aged, steak fat into the mix. Think “pancetta” but made from cows. This (tallow) is why the fries at McDonald's used to be spectacular. Honestly, you could have infused a dog turd with this stuff, and it would have been hard to pass up. If theyhad found a way to weaponize it, our enemies would have forgotten what all the fuss was about. Apologies for the crap photo--the Samsung Lotus does not come with a flash.........sigh. The burger had a perfectly even sear that makes you wish that it had even more surface area. The high heat at which the burger was cooked rendered the aforementioned fat so that it blended with the chuck to the point where everything tasted like steak. The sweetness of the toasted, buttered, sesame brioche perfectly offset the saltiness of the seared crust, and the cheddar, which they used bound the entire thing with a warm and gooey finish. Meat-to-bun ratio: Dead On! They cooked the burger to medium rare, and anything beyond that would have been criminal, Med Rare---warm, red, center, in this case. Other stuff: The pickles were sweet, crinkle cut dill, which were made on site. If you get the lamb sausage and white bean appetizer, you will discover that they also make the sausage on site. The fries were things of beauty, as well— thick, crispy skin with a creamy center and a generous dash of sea salt to finish them. 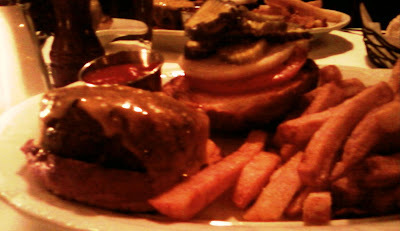 Burger Review : It was truly great burger in NYC.